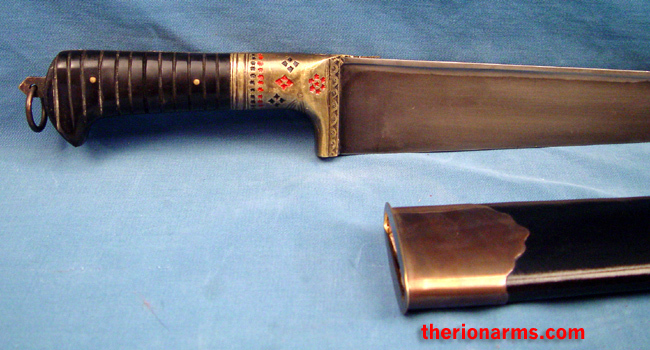 This impressive knife / short sword comes from the Khyber Pass area of Afghanistan. A historical style, it's still used (very effectively) in Afghanistan, Pakistan and Northern India. Antiqued finish 1060 high carbon steel blade, worked and painted brass fittings, thick full scale buffalo horn grip, full tang with wrist-strap ring at the end of the grip. T-shaped spine for strength along the length of the blade. One of the world's premier fighting knives. These are beasts, I think you'll really like them.